Bollywood Dance Classes: What is Bharatanatyam? Bharatanatyam is a style of Indian dance. It’s though to be the oldest style, in fact, and originated in Hindu temples in the southern part of India. Because of its origins in the temples, it was traditionally used as a way to communicate religion concepts and stories and wasn’t performed outside of the temples until the 20th Century. While it’s just one of the many styles of Indian dance, it’s one that many people associate with Bollywood dancing and have seen if they’ve watched any Bollywood movies. What are the trademarks of Bharatanatyam dance? Chances are you’ve seen Bharatanatyam but just didn’t know what that’s what you were viewing! It’s a very distinctive style of dance and relies heavily on both the hands (through mudras, which we’ve discussed in a previous blog) and feet to tell the story. One trademark of the style is the squatting position that is often used. The dancer squats with knees and feet pointed out and keeps their upper body in a stationary position. 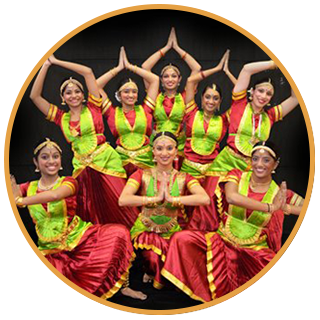 Our Bollywood dance classes are a blend of traditional and modern Indian dance styles, so you’ll learn elements of Bharatanatyam as well as other types of movement styles. We love to introduce our students to traditional methods of dance as well as new modern forms, so they can learn about the history as well as the meaning behind the dances that they perform. Sign up for one of our classes today and start learning more about beautiful and exciting Bollywood dance.